PayPal was the original eWallet, and it is still one of the most trusted names in the UK. The number of people using this service continues to increase, with 7.6 billion transactions processed globally in 2017. So, what exactly is it that has led to its popularity? Well, in many ways, it’s the simplicity that it provides. You can make payments without the need to fill in any complicated paperwork or forms. Moreover, this method is pretty much risk-free in terms of security. For this reason, it’s the first choice of approximately 20 million shoppers, and it’s currently used by 7 million businesses around the world, including many of the leading bingo sites like 888Ladies. The benefits of using this system to add funds are self-evident. It acts as a link between you and the website, and in doing so, it offers you complete anonymity. There isn’t any need to enter all of your details for each transaction either, so it’s incredibly quick to make a deposit online. Your money is fully protected, too. Every transaction is monitored, and the data is encrypted during the transfers to prevent any fraudulent activities. The company has measures in place so, in the unlikely event of an unauthorised amount being taken from your account, you won’t be held liable. And if you do happen to encounter an issue, the customer care team is available around the clock, so you’ll easily be able to call on someone for assistance. There are a growing number of bingo sites that accept PayPal for deposits, and these include many of the renowned brands. Using this method to add funds to your account makes the whole process extremely straightforward. It just takes three simple steps before it is completed. The good news is that, in most cases, you’ll be able to withdraw your winnings with this option too. To do this, you need to make a request under the withdrawals tab and click to confirm it. Your withdrawal will then be processed. The individual websites differ in how long this procedure takes, but it is usually only a couple of days. 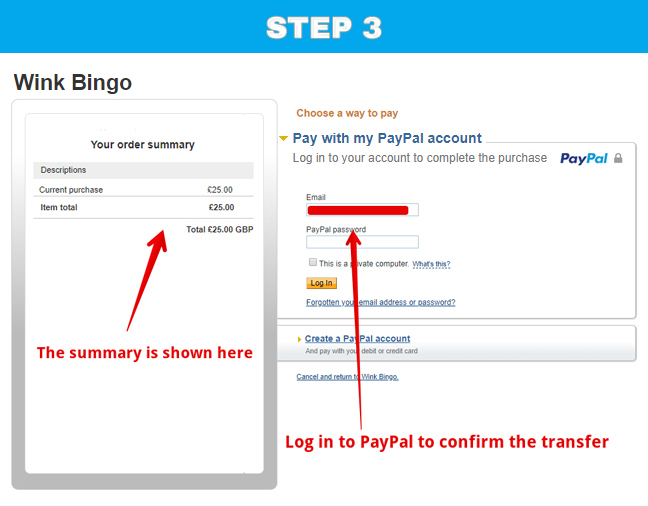 See how easy we were able to make a deposit at Wink bingo using PayPal in just three steps. 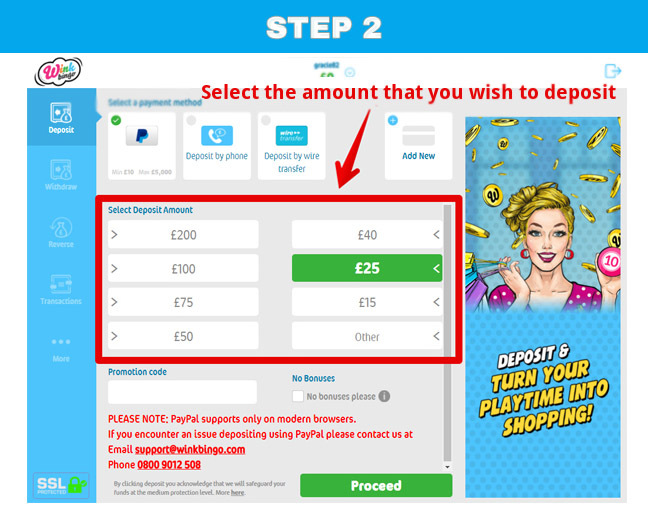 Are There Fees for Using PayPal at the Bingo Sites? In its promotional literature, PayPal asserts that it is mostly free, which is somewhat of an ambiguous statement. However, you won’t be charged for using this payment method if you are buying something, and this includes making deposits. Consequently, the bingo sites are unlikely to charge you anything when you add funds to your account. The only exception to this is if there is any kind of currency conversion involved, and in that situation, you may incur a fee. There will usually be costs applied to making withdrawals, but these will vary between the venues. The particular details for each one will be listed in the terms and conditions on the websites. Can the PayPal App be Used on the Bingo Sites? There is now a PayPal app, and this is available for both iOS and Android in either the App Store or Google Play. In both cases, this is free to download, and it’s very easy to install it onto a mobile device. The benefits of having this to hand is that you will be able to deposit and withdraw funds from wherever you are. The screen displays all of the cash that has been transferred to and from your account. You won’t actually need to use this to add funds to any of the bingo sites, as they have their own payment systems in place. Nevertheless, this is a handy tool to have on your phone or tablet, so if you’ve already come to appreciate the convenicence of bingo apps like bet365’s iOS and Android applications, and you’re using your phone more often than a computer, you may want to add another useful native app that will make your everyday life easier. It’s incredibly easy to open a personal account with PayPal, as the registration process doesn’t involve any financial questions or credit history checks. It’s free to sign up, and you just need to complete a few basic details. Initially, you will select the country that you’re based in, and then complete your name and email address. It’s important to be accurate with this as you will be using it for your ID during transactions. You’ll also be asked to choose a password. The next step is to fill in your address and your telephone number. You can use your mobile, if you like. The other information needed here is your date of birth and your nationality. You’ll be given the option of staying logged in for faster checkout, and if this is something you’d like, you can tick the box. The last stage is to confirm that you’ve read the terms and conditions. Your account will then be created. When you’re registering with PayPal in some locations, you’ll be offered the chance of using One Touch, and the UK is one of the countries in which this is available. This service allows you to stay logged in at all times. If you choose to do this, you won’t need to sign in with your email and password when you want to make a deposit. Instead, you will simply be asked to review the details of the transfer, and then you’ll click to confirm it. This isn’t recommended if you share a device, and if you have any security concerns, you can turn off the option in your account settings. Even if you do opt to use this facility, from time to time, you will still be requested to sign in as normal, just as a security measure. 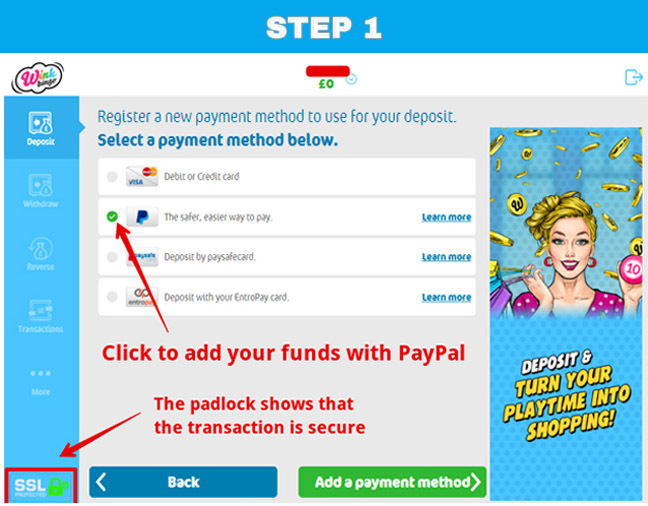 Once your PayPal registration has been completed, you will need to add your preferred payment method to your account. This can be either a credit or a debit card, or alternatively, you can use your bank details if this is better for you. To complete the process, you should click on the wallet icon at the top of the page and then click on your preferred choice. You’ll then fill in the information and then tap to make the link. In some instances, you’ll be asked to verify this. If this is the case, you’ll be sent a 4-digit code, and you will input this to make the confirmation. PayPal has added an extra level of security for credit and debit card users. This is known as 3D-secure, and it adds another layer of verifications during the transfer procedure. Each of the banking facilities has their own version of these, so you will come across Verified by Visa, MasterCard SecureCode, and American Express Safekey, but they all work in the same way. You will be given an authorisation code by your bank, which is entirely separate from the passwords that you are using for your regular accounts. If you are prompted to do so, you will simply enter this number and the transaction will be processed in the standard way. This won’t happen on every occasion, but when it does, you will need to input the code before you can add any funds to your bingo account. You are unlikely to encounter any serious issues during either the registration process or the transactions. There are, however, a few key points that it is useful to know about the general process. If you forget your password, you will need to set a new one. To do this you will enter your email, as is usual when signing in, and then click on ‘having trouble logging in’. Select that you wish to recover your password, and then pick the option that is best for you. It’s very easy to move your winnings to your standard bank account if you are based in the UK. You will have to go to the summary section, and from here, click on withdraw money. Then select where you are transferring your cash. It is usually completed in 2 hours. If you wish to report any unsanctioned activity on your account, you can do this through the resolution centre on the website. To do this, click on ‘dispute a transaction’, and select the option for unauthorised transaction. You will then be able to make your report. PayPal provides an excellent customer support service, and the team will be able to assist you with any matters that may arise. There is also an active community help forum, so if you have a particular query, you may get some advice there. Additionally, there are some other frequently asked questions listed on the website, and these cover a wide range of topics.